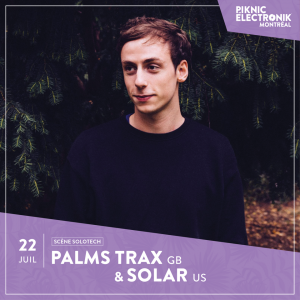 Piknic Électronik’s diverse programming has made it a highlight of the Montreal summer cultural circuit for over 15 years. 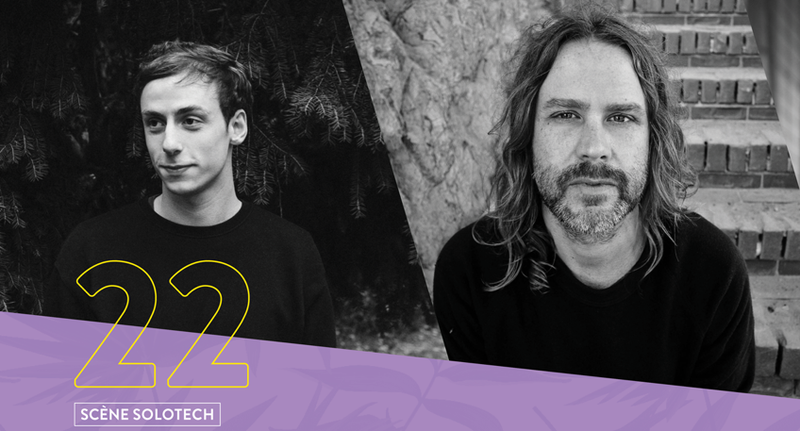 We are very happy to present Solar B2B Palms Trax on July 22 at the Solotech Main Stage. San Francisco’s Solar began DJing in the early ’90s at a time when DJs needed a strong dedication to the craft to keep people to dance all night. A deep record collection and bold creativity were what people valued most. In 1994, Solar and a couple other DJs began bringing a sound system and generator to the Berkeley Marina for free gatherings to dance and watch the sun set behind the San Francisco skyline. As these sunset parties grew from dozens to now thousands of attendees, Solar become one of San Francisco’s most loved DJs. 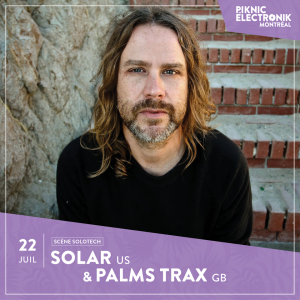 Known for his eclectic sets of blending Techno, Disco, House, Electro, and electronic music with the energy of Punk and Psychedelic Rock, Solar has built a loyal following among a discerning crowd of dancers and party goers. Nearly twenty years of playing music for crowds large and small has evolved his style of DJing that seamlessly fuses the best of classic and modern dance music. Palms Trax is a producer and DJ based in Berlin, Germany. His first record was released in October of 2013 on London-based imprint Lobster Theremin. A gradual but steady stream of EPs released on Dutch dance music powerhouse Dekmantel have allowed his productions to blossom in richer, smoother directions. On 2015’s “In Gold” EP, and throughout the following year’s “High Point on Low Ground”, euphoric piano lines, bubbling acid, and luminescent keys are shot through with Donaldson’s tough, distinctive percussion. Donaldson has also-amassed a patient, open-minded following with his cult monthly radio show, the decidedly less-than-culinary “Cooking with Palms Trax”, broadcast on Berlin Community Radio since 2015. On each show, Donaldson takes a deep, vinyl-led drive into his adopted history, fostering a level of trust and shared curiosity that has allowed him to helm all-night sets under the “Cooking with Palms Trax” moniker.